1. Go tho the Google Chrome Web Store. Download and install the free extension on your Chrome Browser. 2. After the Installation, login to Gmail inbox with your user ID and Password. 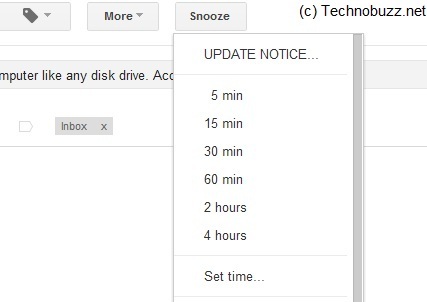 Here you can see the new Snooze Button on your Gmail Account(See the Image Below). 3. To set reminder for any email, just click on the button and set the time after which you would like to be reminded about it. So when the time comes for an email to reappear, you will get the reminder on your desktop, you have two options to get the reminder: a desktop reminder that pops up in the corner of your Windows, and second simply re-marking that message as unread. 4. So when the notified time comes, a pop up appears on your desktop which reminds you of your important mail that you have to read or reply. In the notification, there are handy links to open the email or to snooze it again. We tested this app on our personal account, Snooze Your Email works quite well. And one of the best way to get reminder or alert of your important mails. 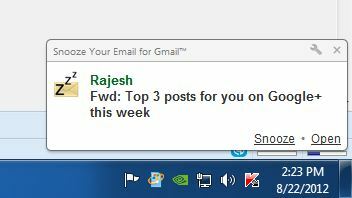 Snooze Your Email for Gmail also apparently works for Yahoo Mail.